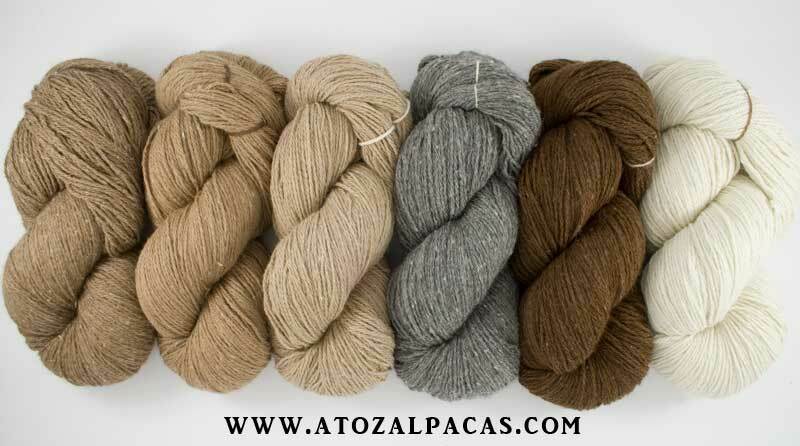 A to Z Alpaca yarn is 100% Canadian & 100% Alpaca! This highly regarded and much sought after rare Canadian Alpaca fiber and yarns are available in natural color and hand dyed yarn skeins. Each hand dyed skein is truly one of a kind Alpaca yarn is similar in texture to cashmere. The silky texture is perfect to enhance stitching details of any project. The fiber and yarn is produced with extreme care and conscientiousness to produce the most perfect and debris free fiber and yarns available. Yes! I am OCD with my alpacas and products but I will only produce and sell the highest quality products available! 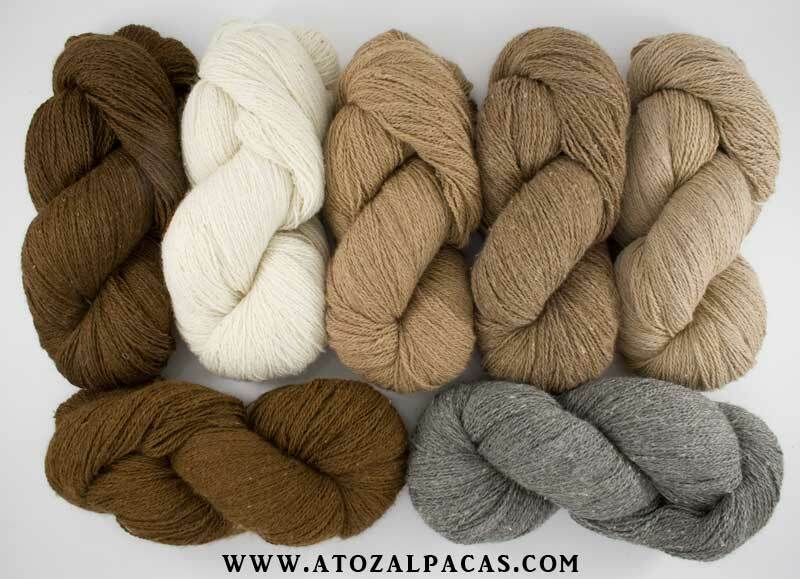 Garments made from Alpaca yarn are up to 8 times warmer than wool, yet light, sumptuous, comfortable and super soft. It also contains no lanolin, therefore is considered hypoallergenic and is a perfect alternative for those who have allergies to sheep's wool! 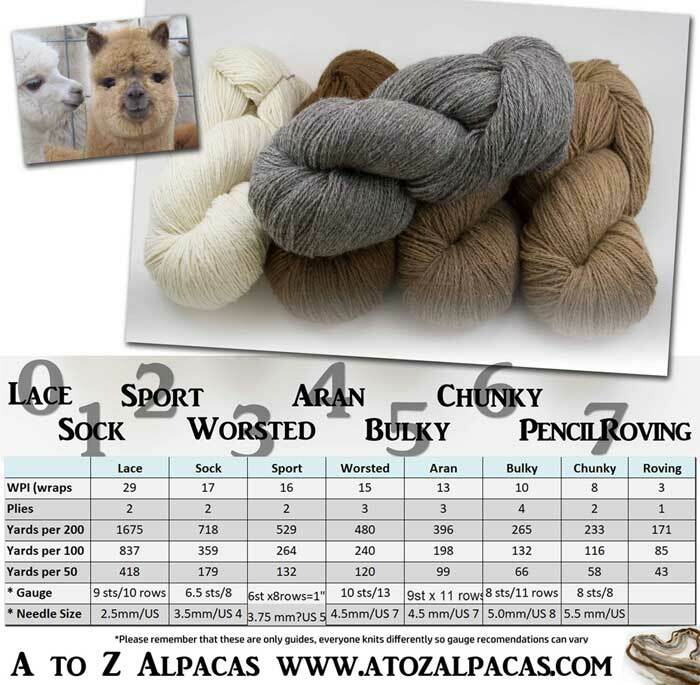 Why Choose A to Z Alpaca Yarn?? 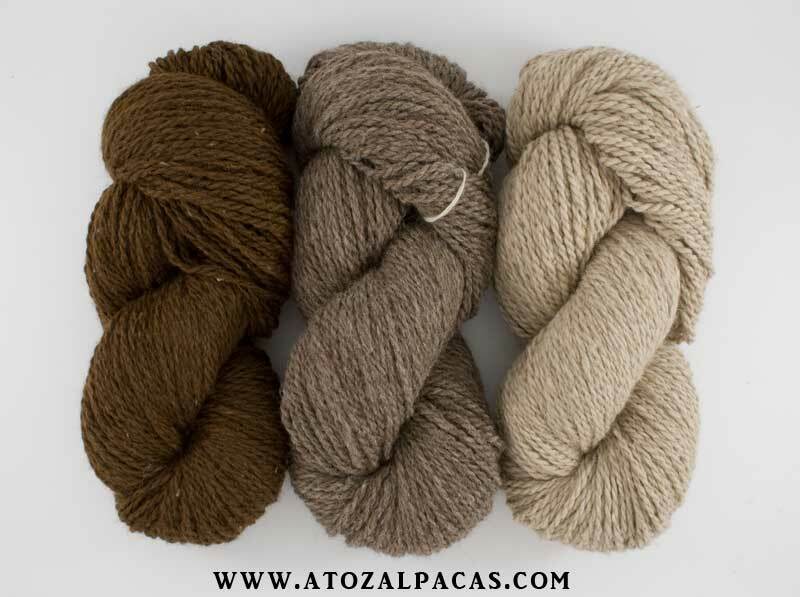 Our affordable alpaca yarn is raised and produced in Canada.. when buying alpaca yarn from Peru or anywhere else across the world you have no idea what you are getting. It may not even be alpaca!.. and even if it is its likely not a fine grade. We use only our premium, luxury soft baby and young adult fiber to produce our alpaca yarn. With over 300 alpacas and over a decade of knowledge we are confident in the quality of our yarns. We LOVE and adore our alpacas and are so grateful to them for donating their fleeces for us. Our customers have described our yarn as squishy, incredibly soft with a perfect halo, very warm and cozy, and easy to work with as the stitches glide along the needle or fingers effortlessly.And did I mention.. oh so SOFT! Perfect for knitting, crochet, weaving or any other yarn project. 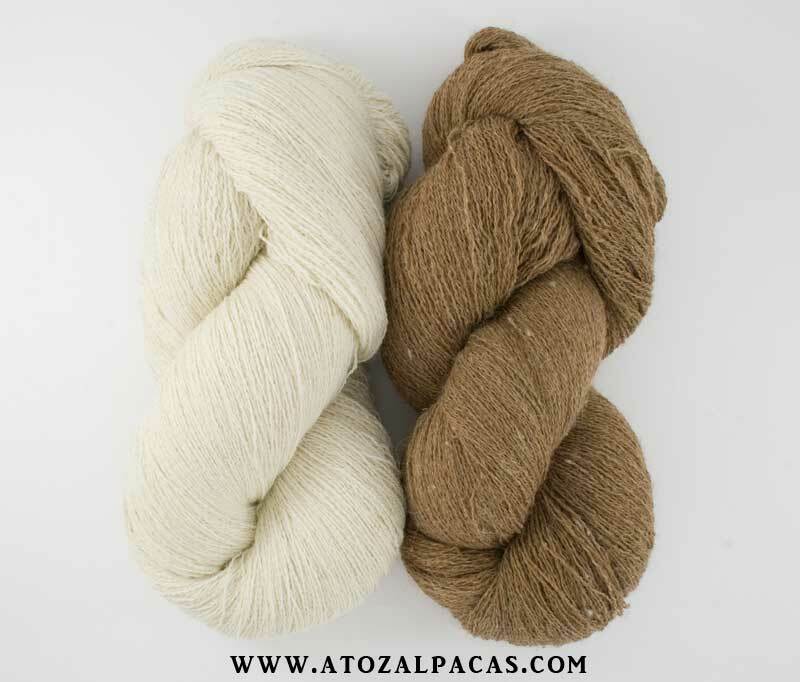 Care instructions: Alpaca yarn is feltable, so gently hand wash in cool water with a mild soap and lay flat to dry. Do not agitate, twist or shock the fibers by placing in cold then hot water or it will felt. Because of the nature of this fiber (its hair shaven from an animal) it is suggested to wash your finished product when blocking. Even though the fiber is washed at the mill before processing it still contains enough to darken clean water so its best to wash your finished products when blocking. The easiest way is to let soak in warm water with a bit of your favorite laundry soap. Let it sit (don't agitate it at all) for half hour or so. Then rinse in cool water. I use my top load washing machine to spin out the excess water and then lay it out flat to dry. Here are the yarns from thinnest to thickest.. all of it is 100% Alpaca! The Chunky has been discontinued due to our mill not being able to make it again. So get it while you still can! SOLD OUT! of Chunky Dyed! All of the alpaca fiber we offer is royal baby quality! We offer fleece, fibers, rovings, combed top, All 100% Alpaca! We also carry premium royal baby pencil roving and combed top! Pencil Roving is the thinner of the two, and Combed Top is the thicker puffier kind:) We currently carry 5 natural shades of the pencil roving, 2 of the combed top and LOTS of hand dyed colors as well :) Our rovings are processed at the Exotic Fibers of Canada Mill in Innisfail. They do great work! Price is $70/lb (Canadian Dollars) for both Pencil Roving and Combed Top. To order the Dyed please message me with you letter/number choice. Alpaca filled bedding made by Crescent Moon Duvet Company! Alpaca on the farm Crescent Moon uses 100% natural, organically grown alpaca wool. 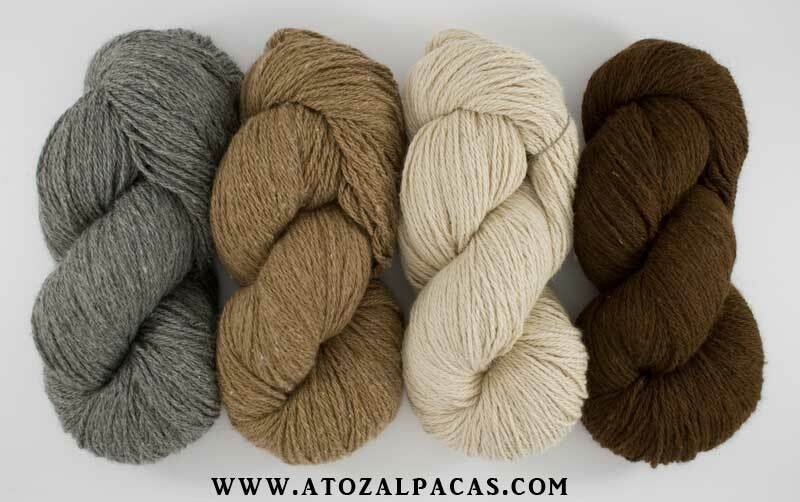 Alpaca fiber is hollow, making it one of the warmest natural fibers available. It is also very light and soft so we add some sheep wool to hold the fibers apart and produce more loft. This incorporates more air into your duvet which will then act as an insulator, keeping you warm and comfortable. Alpaca fiber's porous nature is naturally dry and clean which prevents dust mites and other allergens from settling in. Recent research has found that dust mites are one of the most common causes of asthma and allergies in the bedroom. Environmentally FriendlyThe shorn animals are raised in a pesticide free environment and their wool is a renewable resource. No chemicals, dyes or bleaches are used when the wool is processed. We use only 100% organic cotton fabric so the whole product is 100% biodegradable at the end of its long life. Alpaca fiber loves fresh air and will re-loft when put outside for a few hours. Our products are also washable – with care. Please refer to our washing instructions. People who sleep with wool get a longer, more restful sleep – up to 15% longer and deeper. Your morning bed-making is less stressful as well. We recommend the use of a duvet cover so you just give the duvet one good shake over the bed and you are ready to start your day! Crescent Moon and A to Z Alpacas is pleased to offer alpaca duvets, mattress pads and pillows with outer coverings of 100% certified organic cotton 260 Thread Count (TC). Our 260 TC fabric has a pore size of 4.5 microns and is SKAL and GOTS certified. Our duvets are made with one ounce of alpaca wool batting per square foot. 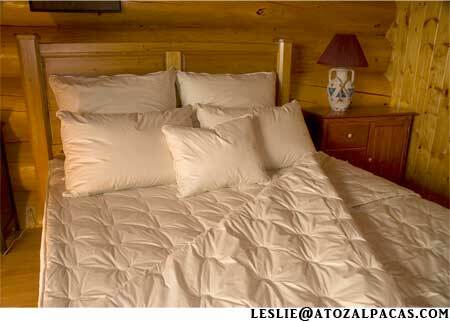 We also make a light weight duvet which can be used for the summer or for the extremely warm person in the winter. The mattress pads have one and one half ounces of batting per square foot. Sleeping on alpaca is very therapeutic especially for folks with body aches and pains. Both the duvets and mattress pads are packaged in a reusable cotton drawstring bag. Alpaca Wool Socks are Incredible! WARM: Alpaca fiber is much warmer than sheep's wool and will keep your toes warm and happy. HYPOALLERGENIC: These are unlike wool socks in that they do not itch! The alpaca fibre is lanolin free making these a perfect choice for someone who has allergies or unpleasant reactions to wool. DURABLE: Alpaca fiber is stronger than sheep's wool. These will last! WICKS AWAY MOISTURE: Alpaca, like wool has the ability to wick moisture away from your skin leaving your feet feeling dry. They also resist odors and many 'alpaca sock lovers' claim to have considerably less foot odor. Major bonus! LIGHTWEIGHT: Alpaca fiber is light weight making a less bulky sock. COMFORTABLE: These are super cushiony and cozy on your feet. I can't stress this point enough.. seriously the most comfy pair of socks ever! 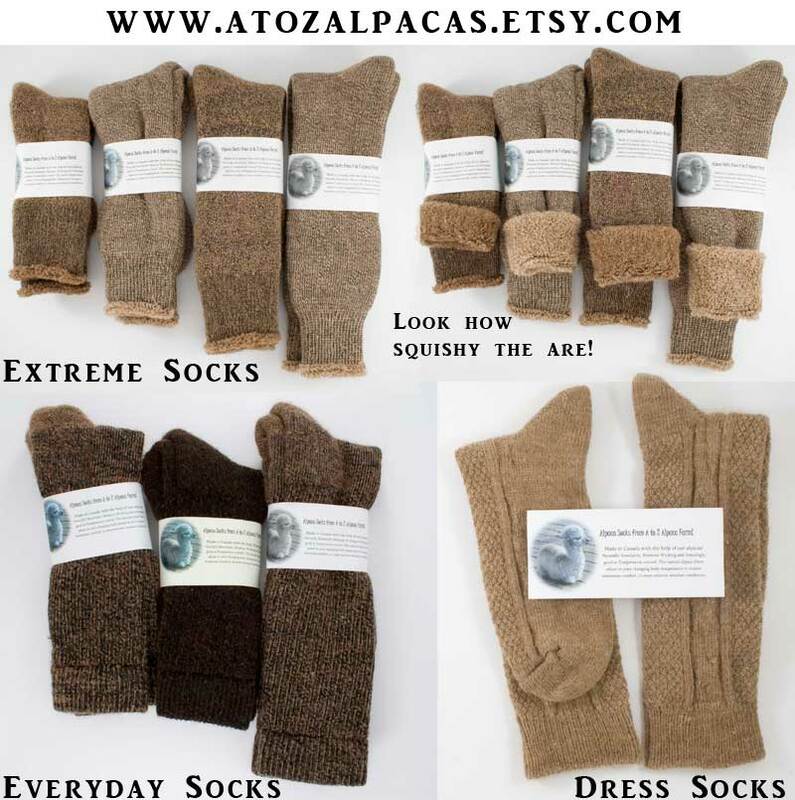 WEAR ALL YEAR LONG: Alpaca socks are like wool socks in that they are great insulators! Keep you warm in the winter and cool in the summer. Our socks are made with a high alpaca content resulting in a warmer, stronger sock. The Nylon and very small amount of spandex help the sock to fit snugly around your foot and ensures the socks hold their shape. Wash Instructions: These are machine washable on low heat/delicate settings. However I highly recommend hand washing them. They will last longer and if you accidentally get them into a hot load they may felt and shrink. They do not need to be washed as often as regular socks.. in fact we only wash them after wearing for a few days in a row. You can't wear a regular pair of socks a few days in a row without washing.. but these alpaca socks are far from normal! 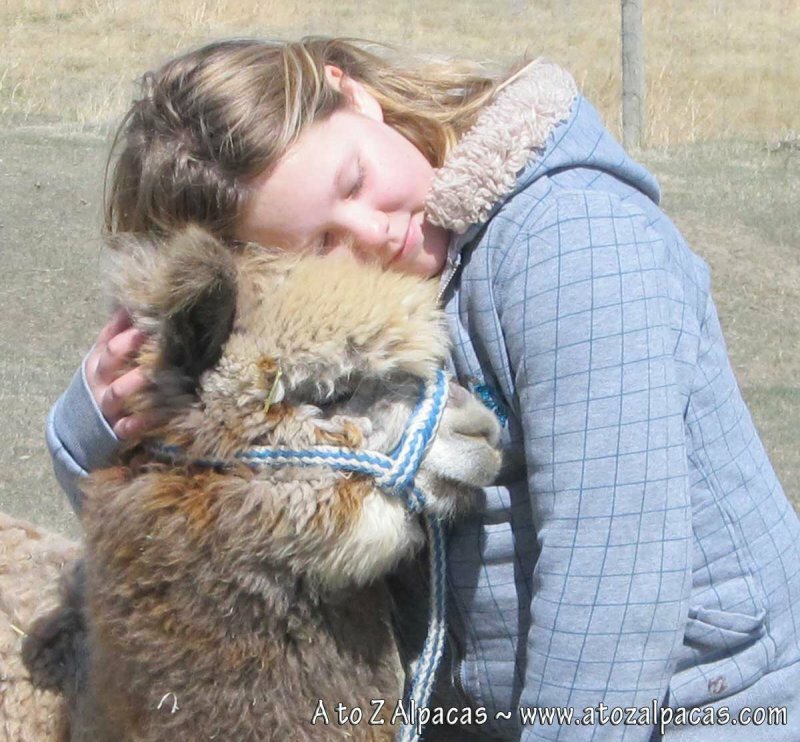 A to Z Alpacas is located in Southern Alberta, Canada, between Brooks and Taber. We have a large number of high quality breeding males, bred females and Gelding males for sale. * Crias from 2018 are not included in the price.